If you’re one of the thirty-four (thirty-four!) people who follow me on Twitter, you will have seen everything that follows last night. For the rest of you, this all started with Colleen McCulloch. When I was a kid, my parents had two books on their shelves that I particularly remember. One was The Thorn Birds, which I gather is something of a classic, both on the page and on screen. The one I actually read was Tim, about a mentally retarded adult (can we still say that? I genuinely can’t keep up these days) and his burgeoning friendship with an older lady. It’s mostly inoffensive, although there is an incident with a sausage sandwich that I still can’t really think about without feeling nauseous. It was made into a film in 1979, starring a very young Mel Gibson, along with Piper Laurie, who did not dress up as a man or lock anyone in the cupboard while she prayed over them. The sausage sandwich scene is mercifully gone and the ending is changed, but it really is quite good. 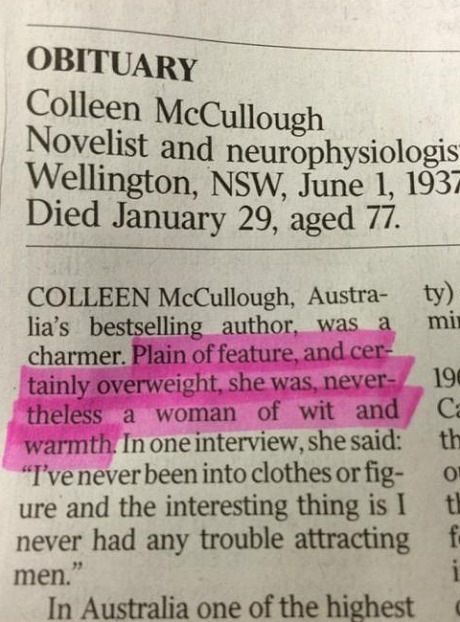 Colleen McCulloch was therefore a household name, at least in our house, while I was growing up, and it was with some sadness that I learned of her death a couple of days ago. I also learned of a few other things I didn’t know: she spent much of the latter years of her life on a Pacific island to escape the pressures of fame, had an early career in neuroscience, and refused to write a follow-up to The Thorn Birds (as well as hating its adaptation). Tributes came flooding in, and obituaries were warm and generous in their appraisals. Except, it seems, for The Australian. They opened their obituary with this. This is, I’m informed by more than one source, fairly typical of the Australian media, who frown upon successful women. I don’t have the time to research this properly, but irrespective of cultural norms there is absolutely no way you can justify such a monstrous opener. I have never held with the “Do not speak ill of the dead” maxim (are we really not allowed to tell the truth about Thatcher? Osama bin Laden? Hitler?) but this is just ridiculous. The article led to a sea of acidic responses from corresponding publications (which was predictable; there is nothing any media outlet likes more than having a pop at one of its rivals), and before we knew it, #myozobituary was trending on Twitter. Anyway, having composed my own version of one of these (“Despite being arrogant, acne-ridden and obese, he nonetheless managed to manufacture enough sperm to sire four children”) I had an idea, and one thing sort of led to another. But why stop at the first? I didn’t, although one of these obituaries is not like the others. See if you can work out which. I didn’t do any more; I think we’ve taken this to its logical breaking point.